A Delta AirlinesB747-451 Boeing is probably going to have to be scrapped after Chinese Authorities failed to respond to an emergency. Delta 159 from Detroit to Seoul flew into a major storm over north West China and the pilots had asked to be vectored away. But Chinese ATC refused. 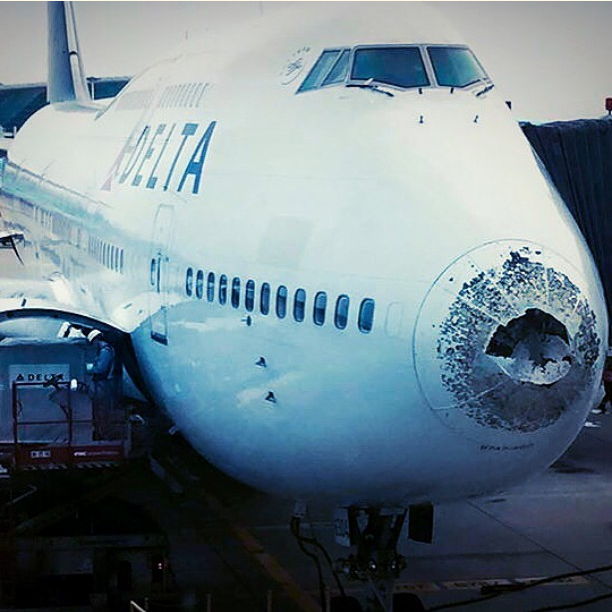 This led directly to major damage to the airframe caused by hail and stress to the extent that its now reported the plane will be patched up and flown directly to Mojave to join the plane graveyard. Take a look at the pictures..
They’re from passengers and crew aboard. If that doesn’t scare you nothing will. Civil aviation is forced down by 10 000 feet from the normal high altitude flying by the Chinese military which controls the upper airways – and this is a problem. As China waves its arms around demanding to be taken seriously and to join the rest of the world it’ll find using its military as a cudgel will lead to a disaster. Tweets from those aboard are terrifying with baggage flying around, people thrown from seats and the pilots begging to be allowed to deviate or a serious incident would occur. Eventually the Chinese relented but not before the damage reached catastrophic proportions. Delta 159 Detroit – Seoul flight path. I don’t have the pictures from the wings, but if look at the nose, then the leading edges of the wings must be a mess. Surely this plane was close becoming uncontrollable – and all because the Beijing Regime has a love for its military. That’s abnormal. So dear friends, if you’re going to fly to China take note of these pictures. No wonder SAA bigwigs want to cut back on the direct flights there which are costing us hundreds of millions – I’m some have experienced this backwards aviation nation as it tries to pretend its catching up with the modern world. While the ANC wants these crony flights to continue and the taxpayer to cough up so that their minions can boast about wondering around the Great Wall, consider your life at risk with this kind of ATC management principle in place. They’d rather kill a plane full of passengers than risk upsetting some general by letting the pilots take a decision in the interests of safety.